Shares of Reliance Industries Ltd (RIL) have risen 22% in the past year, compared to a 6% decline in the Nifty 500 index. This is despite the fact that refining margins are subdued right now and spreads in the petrochemicals business have come off. While the consumer businesses—Reliance Jio Infocomm Ltd and Reliance Retail—are growing at a brisk pace, they account for roughly a fifth of overall profits. As such, the heavy lifting, as far as driving growth goes, stays with the mainstay refining and petrochemicals businesses. RIL’s December quarter (Q3) results show things have indeed slowed down in these segments. Together, their earnings before interest and tax (Ebit) rose 1% on a quarter-on-quarter basis, down from 1.9% in the September quarter and 11.2% in the June quarter. This translated into sluggish growth at the consolidated level as well, with Ebitda (Ebit plus depreciation and amortization) growing by only around 1% sequentially. While this may be on expected lines, flat profit is a worry because RIL’s debt has been rising at a rapid pace. Ahead of the results announcement, analysts at Jefferies India said in a note to clients, “Rising debt at telecom & retail is likely to leave consolidated net liabilities about $2.5bn higher sequentially to ₹ 3.2 trillion." It’s little wonder RIL has begun talking about deleveraging. It is in the process of transferring its fibre business and its tower business out of Reliance Jio Infocomm Ltd to separate firms. This is a precursor to a stake sale in these businesses. V. Srikanth, joint chief financial officer, said, “If you were to look at the asset monetisation, be it tower or fibre, it means that our balance sheet next year will be even more stronger, because you have cash on one side and some of these assets not being in the balance sheet." It should be noted here that while reported profits at Reliance Jio have been on the rise, cash burn remains high. In Q3, Reliance Jio reported cash profits of ₹ 2,515 crore, but capital expenditure remained high at ₹ 14,000 crore, resulting in huge cash burn. The fact that the company is looking at asset monetization, rather than a strategy of increasing cash flows by raising telco tariffs is a worry, not only for its competitors, but also its own investors. Sure, parts of its digital business are yet to generate cash, although it remains to be seen how far segments such as broadband contribute to cash flows. Coming back to RIL Q3 results, growth in its telecom business has stayed impressive, with revenue growing by over 12% sequentially. Reliance Jio’s competition is expected to report a decline in revenues in Q3. The retail segment—the other leg in the consumer business—has delivered yet another strong quarter with segment Ebit increasing 21.5% on a sequential basis. As expected, the segment got a boost owing to the festival season. The segment performance was also helped by new store openings. According to the company, footfalls for Reliance Retail increased 21% year-on-year. In the energy businesses, analysts say refining margins may be close to bottoming out. Under the new rules issued by the International Maritime Organization, the limit for sulphur content in fuel oil used by ships has been lowered starting 2020. Accordingly, product cracks are anticipated to increase owing to the expected boost to demand for low sulphur diesel/ middle distillates globally. In Q3, RIL’s gross refining margin of $8.8 a barrel was broadly in line with analysts’ expectations. In the petchem division, strength in polyesters offset softness in the chemicals business, resulting in slightly better profits sequentially. This is better than some estimates that profits for the division would be flat. But as pointed above, the big worry is the continued rise in indebtedness, especially in the backdrop of flat profits. 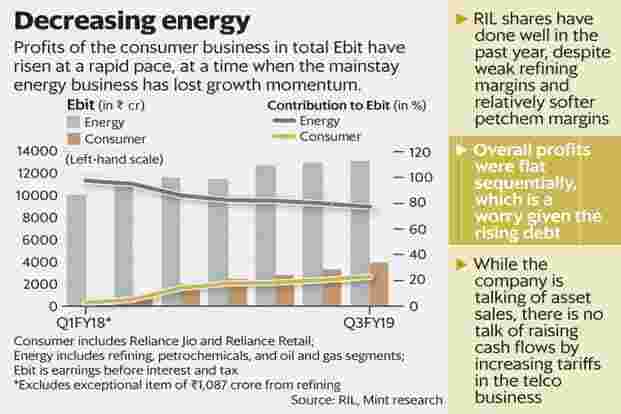 While domestic flows to large-cap shares have helped keep the RIL stock on steady ground despite these headwinds, it remains to be seen how far investors will be patient.